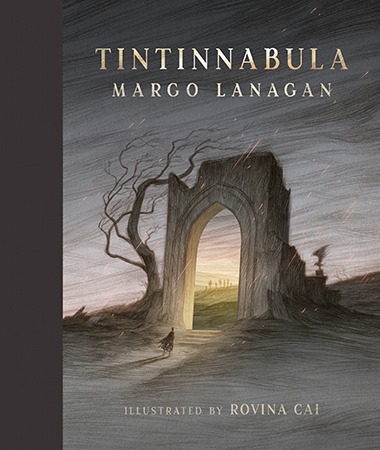 Acclaimed for her short stories and novels, Margo Lanagan’s latest creation Tintinnabula is a picture book that explores light and shade. Through a poetic narrative, the story looks at the different things that can confront us, while conveying the message that in times of trouble it is often within ourselves that we find comfort. The title references a tinkling bell—bells in ancient times were used to ward off evil and bring good fortune. The story reflects this notion, as the character is on a journey to escape difficulty and reach a place of calm and peace. The character is initially shown in darkness, small and hounded by ghostly shapes. But as the journey progresses, they move to the forefront, and the landscape shifts from a burnt fiery red to a green and light-filled space. Rovina Cai’s artwork brings each page to life; her haunting images and use of soft hues complement the language and add to the overall mood and atmosphere. Cai produced the cover illustration for Lanagan’s short-story collection Singing My Sister Down, and they are proving to be a pairing as formidable as Neil Gaiman and Chris Riddell. This book communicates on many levels. The layered meaning makes it appropriate for older children and its lyrical nature and gentle repetition will appeal to the young. All ages will love it for its beauty.